Prairie Creek is a 14,000 acre sanctuary of old growth coast redwood set aside as a state park in the 1920s. Managed cooperatively by the National Park Service and California State Parks, it is 50 miles north of Eureka and 25 miles south of Crescent City on Newton B. Drury Scenic Parkway off Highway 101. Phone (707) 464-6101 ext. 5301 for more information. Elk Prairie Campground: Sites 6, 22, 23, and 69 are designated accessible. All are generally level with paved parking. Sites 22 and 23 have accessible tables placed on firm surfaces, and accessible campfire rings. All four cabins within the campground are accessible, including parking and routes. Electricity is available within the cabins. There are no restrooms in the cabins. Restrooms/Showers: Both restroom/shower buildings in the campground are generally accessible and are a short distance from the campsites and cabins. Generally accessible parking adjacent to site 69 is a short distance from the south loop restroom/shower building. Gold Bluffs Beach Campground: This small campground features accessible sites on hard packed dirt and gravel. Accessible combination restrooms with showers are available. Restroom/shower parking is paved; however the route to the restroom is on hard packed dirt and gravel. Big Tree Trail: 0.16 mile. Trailhead is on Newton B. Drury Parkway 1/8 mile north of the Big Tree parking area. Roadside parking only. Campfire Center Trail: 0.34 mile trail through the redwoods. Trailhead, potable water, accessible restroom and accessible parking are located behind the Elk Creek Prairie Campground. Prairie Creek Trail: Class I, 1.5 mile trail through the redwoods. Trailhead located across from Big Tree Day Use Area off of the Newton B. Drury Parkway. Redwood Access Trail: 0.26 mile trail through the redwoods. Trailhead and parking on Parkway across from Rhododendron Trail. Revelation Trail: is a 0.75 mile trail located between the Elk Prairie Campground and Park Visitor Center. 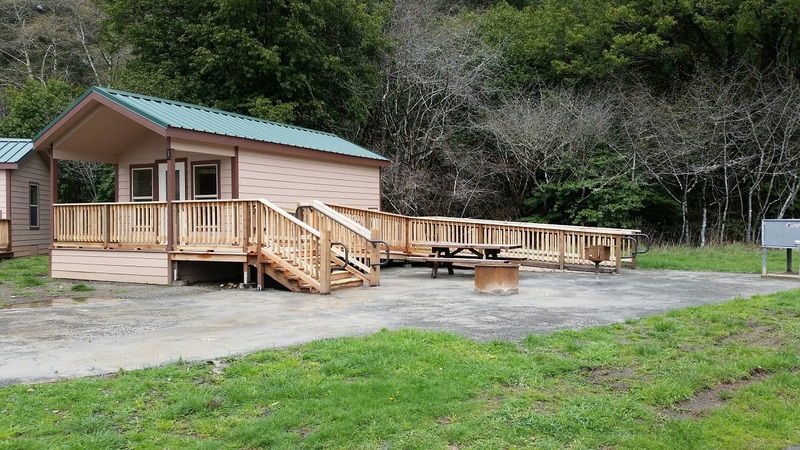 The trail takes visitors through old growth redwoods and provides accessible trail access to the campfire center, Elk Prairie Campground and Visitor Center. Accessible restrooms are provided near the Visitor Center. Foothill Prairie Creek Trail Accessible Loop: This 1.95-mile trail starts 0.25 miles down the Cathedral Trees Trail from the park Visitor Center and uses a portion of the Prairie Creek Trail and Foothill Trail to create the accessible trail loop. Additional accessible trailhead parking and an accessible restroom are planned for the Big Tree parking area. The trail accesses spectacular old growth forest to include the big tree and pedestrian tunnels through downed old growth trees. Elk Prairie Trail: This 2.06 mile trail connects the Elk Prairie Campground to the Foothill Trail. A short section of the Cathedral Trees Trail is included in the total distance (to connect the northern end of the Elk Prairie Trail to the Visitor Center). Departing from the campground (near campsite 63), visitors will experience hiking along Prairie Creek through woodland riparian vegetation, followed by a short hike up and around the prairie landscape. The trail crosses the Newton B. Drury Parkway, climbs up into the redwood groves with views looking over the prairie, and then along Boyes Creek through more woodland riparian vegetation. A beach wheelchair is available for check-out at the Gold Bluffs Beach Campground kiosk. Phone (707) 601-4634 for more information. Within the Redwood National and State Park system, The Thomas H. Kuchel Visitor Center in Orick may also have beach wheelchairs available. Phone (707) 465-7331 for more information.